2019 Tunica Raffle Tractor - Battle of the Brands to support St. Jude! We-Jeff Gravert, Pete Petznick, and I, Bryan Lively-want to thank everyone who donated time, talent or finances to the 2018 Tunica Raffle Tractor to benefit St. Jude Children's Research Hospital. Thank you to everyone who bought a ticket as you raised over $90,000 for St. Jude! The winning ticket was purchased by Carl Buckner of Fair Grove, Missouri. Congratulations Carl (shown). Now-on to 2019! This is the fifth year of the program, and we wanted to do something special, so we have not one, but two tractors to give away on December 7th, 2019 at the Southern Nationals in Tunica, Mississippi! 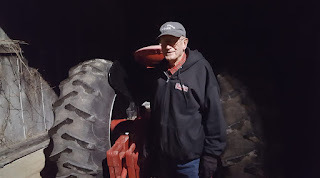 The photo below shows one of the actual tractors: The Farmall M was donated by Robert Niethammer of Saline, Michigan; a huge thank you to Robert for your kindest of gestures! It is a 532cid Baker Engines machine and is a nationally recognized tractor in Division 3 and 4 NATPA competition. It has also been a runner-up in King of the Hill competition at the Southern Nationals under Robert's guide. While we are proud of all the tractors that have come through the program, this tractor is a leap forward in performance and potential. The Unstyled G shown owned by Ron Kolweier is what the 2019 Unstyled G will look like. Still in the build process at the shop of nationally respected 2-cylinder specialist Jim Matzenbacher, some of the best of the best in the 2-cylinder world have their hands in the build. It is THE green tractor build folks have been wanting, and it will be an equal to the M in potential and performance! Now that we have your undivided attention, this Battle of the Brands for 2019 to support St. Jude is up to YOU, those of you who identify as members of Team Red and Team Green! Who will win the ticket sales battle for St. Jude, Team Red or Team Green? The battle is on! 1) Fill out our ticket form and send it in. Be sure to follow the instructions! Thanks for looking, stay tuned to this page for ticket updates and events where the tractors will be, and tickets will be available on site as local regulations allow. We are on a mission for $200,000 for St. Jude in 2019! Thanks for all the support for the 2017 Tunica Raffle Tractor, a Minnieapolis Moline UB. The tractor, like the previous two tractors, raised $20,000 for St. Judes Childrens Research Hospital in Memphis, Tennessee. This year's tractor is a Farmall M set up for 4-6-8mph classes. With a proven 436cid engine combination, the tractor has already gotten on the track-and won! Weighing less than 3800# bare, it will soon have a set of Aluminum rear wheels and an aluminum front weight bracket. We are shooting for a $40,000 donation total for St. Judes from the tractor, it is truly the best one yet! Thank you to everyone who has donated and supported these projects; We are honored that you have chosen to help us in our quest to end childhood cancer through St. Judes! Welcome to the blog site for the Tunica Raffle Tractor. This project is an extension of the efforts of the Midwest Hellion Tractor Pullers and the fundraising they have done on behalf of St. Jude's Children's Research Hospital in Memphis, Tennessee. For the past two years we have raffled off a pulling tractor. Each tractor has generated $20,000 on behalf of the children of St. Judes. This year our project tractor is a Minneapolis-Moline UB. 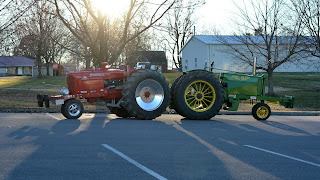 We have been working in cooperation with students in the Ag Mechanics program from the Central Hardin High School FFA chapter in Cecilia, Kentucky in the preparations for this tractor. The tractor will debut in July and will tour around the Midwest for pullers and pulling fans to be able to purchase tickets to win the tractor. Our goal is to bring in $30,000 alone from the tractor raffle proceeds and present those funds to St. Jude's on December 2nd, 2017 during the Southern Nationals in Tunica, Mississippi. We are actively pursuing a non-profit status for the efforts as the success of the program demands transparency and the ability to offer greater opportunity for giving and the benefits of donations to this worthy cause. The success of this project is directly related to the selfless work of many individuals and simply "doing it for the kids." We encourage you to join us in our efforts for St. Jude's and make 2017 our best year yet!